OFCC World Mints > Canada > Ottawa Branch Mint. This section of Obscure Finds Numismatic Collection is about a Mint (an industrial facility which manufactures coins for currency) from the Canada region referred to as the Ottawa Branch Mint. 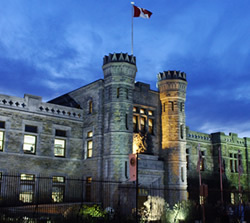 The Royal Canadian Mint's headquarters occupy the historic building in central Ottawa where the Mint was founded in 1908. Today, the Ottawa facility produces hand-crafted collector and commemorative coins, gold bullion coins, medals and medallions. This is where the master tooling is done to create the dies that strike coin designs for both circulation and commemorative issues. The Mint's gold refining and advanced engineering operations are also located in Ottawa. Boutique - Monday to Sunday 9:00 a.m. to 6:00 p.m.
Tours - Monday to Sunday 10:00 a.m. to 5:00 p.m.